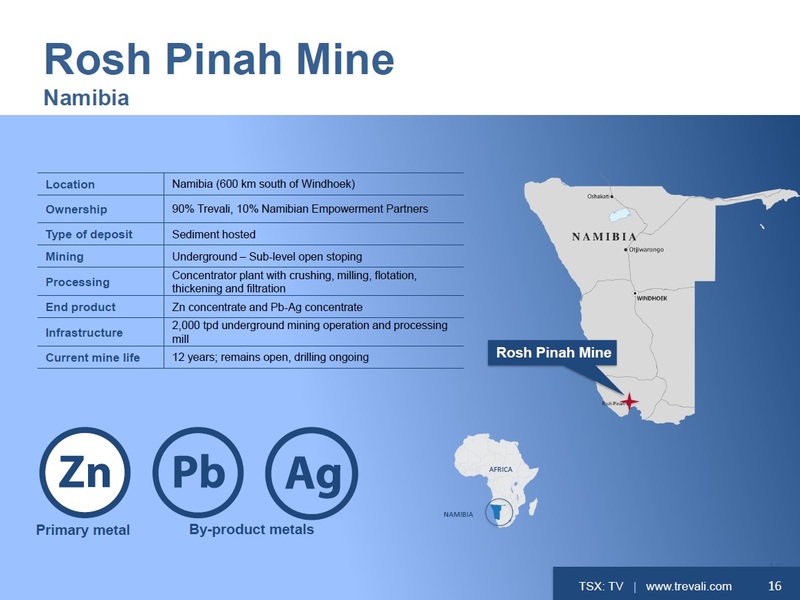 Trevali Mining Corporation is a zinc-focused, base metals company with four mines: the wholly-owned Santander mine in Peru, the wholly-owned Caribou mine in the Bathurst Mining Camp of northern New Brunswick, its 90% owned Rosh Pinah mine in Namibia and its 90% owned Perkoa mine in Burkina Faso. Over 35 years global mine development experience including Vice President Operations at Yamana Gold, Desert Sun and Goldcorp, and is on the Board of Eastmain Resources. Base metal deposit specialist with over 20 years project experience from exploration and resource definition to permitting and production in Europe and the Americas on behalf of Pasminco Exploration, Anglo American and TSX-listed companies. Co-founded Trevali in 2007 to position the Company for anticipated global Zn deficits. 17 years of experience in a variety of roles including senior management positions in both underground and open-pit mining operations. Mr. Schwengler commenced his career with Mount Isa Mines Ltd. at Ernest Henry Mine, then transitioned to Xstrata Zinc and ultimately Glencore at the world-class Mt Isa Zinc operations. He became GM at the Caribou Mine in early 2016. 30 years of mine operations experience in Canada and Peru. Mr. Keller began his career with Rio Algom and has also worked in various management roles with Barrick Gold's Hemlo mine in operations, engineering and maintenance. 18 years experience in the finance and mining industry. Mr. Van Heerden began his career at Deloitte and has worked at Metorex Limited as Group Financial Controller and moved to senior management positions there prior to joining Rosh Pinah Zinc Corp. as CFO in 2013. Over 25 years of geology/mining industry and research/finance market experience. Mr. Stakiw has held a senior management role with a leading mining research and investment publication and has consulted to resource-focused investment funds. Over 24 years of international experience in exploration and underground mining, and has held senior management roles with Rio Tinto and Anglo American (including project manager at Anglo's Michiquillay deposit in Peru). Joined Trevali from McCarthy Tetrault LLP, where he practiced corporate and securities law with a focus on the mining industry. Geologist with 20 years of experience in the resource industry in Africa and the Americas, whose experience ranges from exploration to operations & resource estimation. On January 17, 2019, Trevali Mining Corp. has released preliminary fourth quarter and fiscal 2018 production and sales results. The Company has provided its production, cash costs, and capital and exploration expenditure guidance for 2019. On January 17, 2019, Trevali Mining Corp. announced that its Dr. Mark Cruise plans to step down as president and chief executive officer of the Company while Mike Hoffman plans to step down as chair of the board of directors of the Company, as part of the Company's continuing transformation, vision and strategy to be a premier global base metals mining company. Both Dr. Cruise and Mr. Hoffman will continue in their current roles until their successors are appointed in order to ensure a smooth transition to a new leadership team for the long-term benefit of Trevali and its stakeholders. 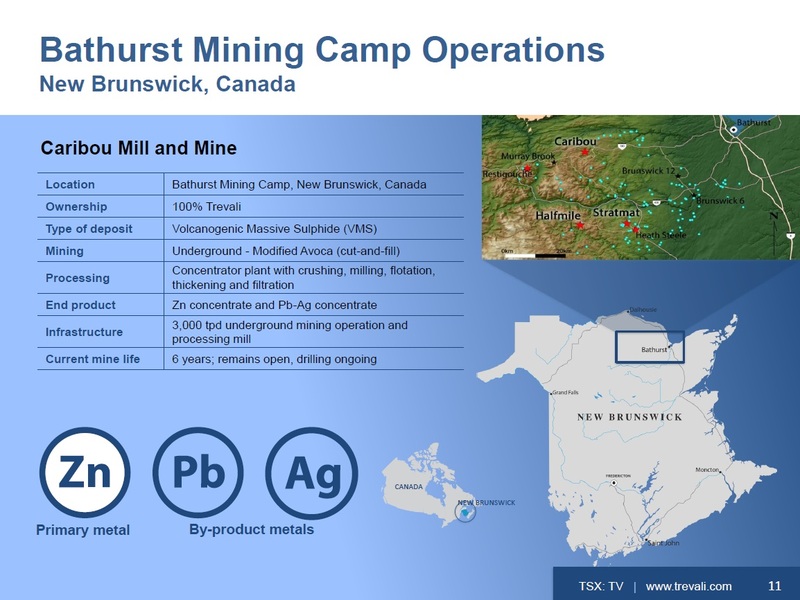 The Globe and Mail reports in its Thursday, Jan. 10, 2019 edition that expecting to see an improved outlook for TSX-listed base metals miners in 2019, BMO Nesbitt Burns analyst Jackie Przybylowski commenced coverage on Trevali Mining (43.5 cents) with an "outperform" rating and a share target of 80 cents. Ms. Przybylowski says in a note: "Trevali has suffered from issues around operational execution and missed expectations. This, coupled with lack of confidence in the zinc market in general, has eroded investors' confidence in management and resulted in a material underperformance in Trevali's share price in 2018. In our view, the sell-off is now overdone. Trevali now represents one of the best value stocks in our coverage universe." On October 22, 2018, Trevali Mining Corporation reported a downgrade of the 2018 production guidance for the Caribou mine due to challenging rock mass conditions. 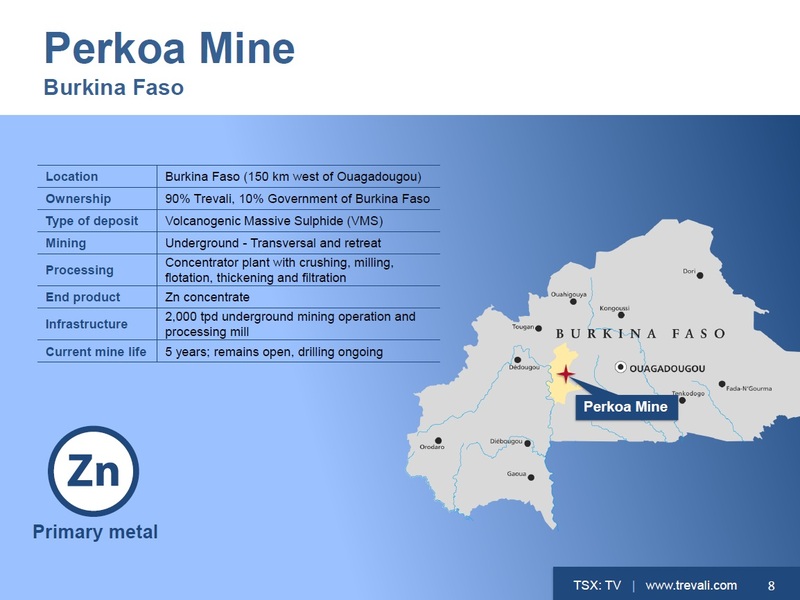 Increased zinc production from Perkoa operations is expected to partially offset metal losses. The Company reiterates it remains on track to achieve its 2018 consolidated zinc production guidance. 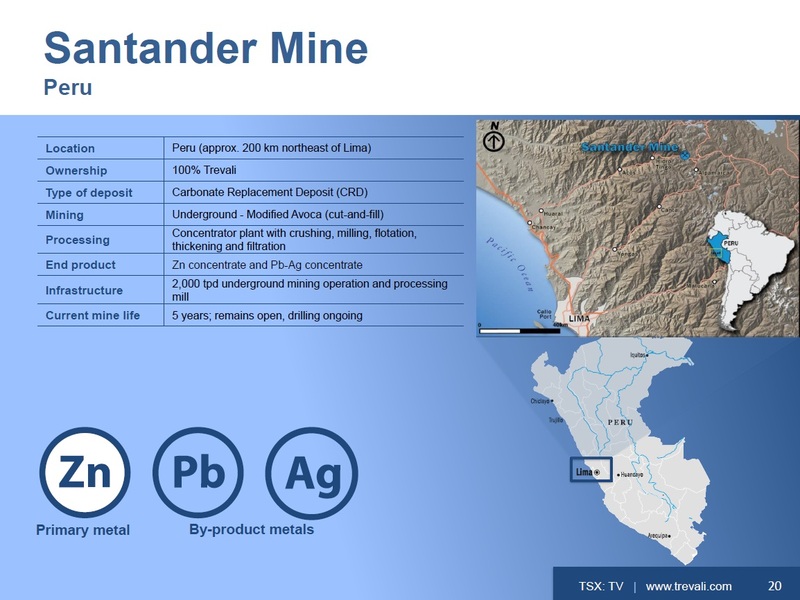 On September 26, 2018, Trevali Mining Corp. reported that its operations at the Santander mine in Peru have been temporarily halted as a result of an illegal blockade. Main road access was temporarily blocked by a small group of community members and other persons not affiliated with the Santander mine, and the company was unable to complete a scheduled delivery of supplies. The protesters allege that Trevali has failed to satisfy its community investment obligations under its agreement with the Santa Cruz de Andamarca community. The Company has complied with all of its contractual obligations to the community and fully co-operated with government departments and other authorities regarding the blockade, which has now been lifted. Necessary supplies are now being delivered to the mine and full production is expected to resume within the week. The Company expects that production and sales for the quarter will be negatively impacted; however, the Company remains on track to achieve 2018 zinc production guidance at Santander. The Santander senior management team is pro-actively engaging with the local community and is in continuing consultation with elected community leaders to discuss their concerns and ensure that mine operations continue without further interruption. On September 19, 2018, Trevali Mining Corp. announced that it has secured a new US$275-million revolving credit facility. The new facility replaces the US$160-million term loan facility and the US$30-million revolving facility entered into in August, 2017. 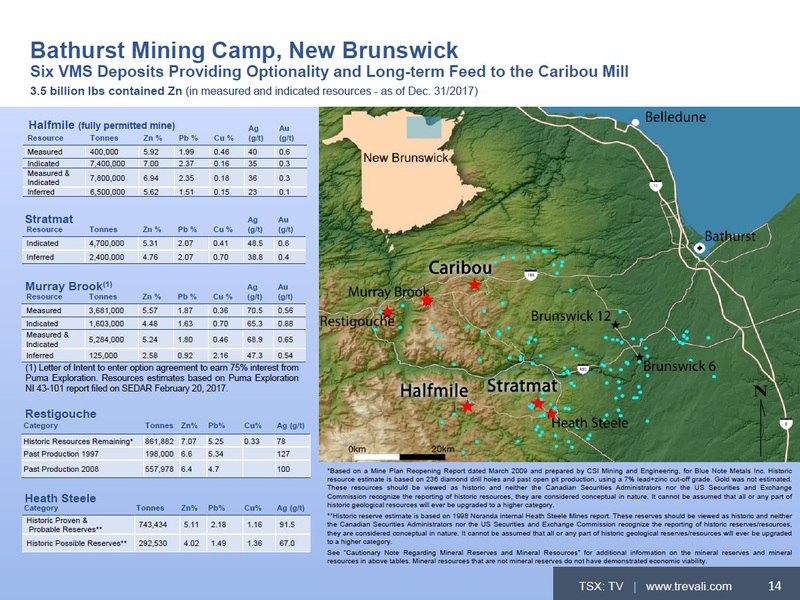 On August 29, 2018, Trevali Mining Corp. and Puma Exploration Inc. have released the drill results for the metallurgical drilling program conducted at the Murray Brook deposit located in New Brunswick, Canada. A seven-hole, 1,700-metre geotechnical and metallurgical drill program was undertaken. The program successfully intersected the massive sulphide deposit in each hole, matching perfectly with the resources model and a potential internal mine design. On August 8, 2018, Trevali Mining Corp. has released financial results for the three and six months ending June 30, 2018. Second quarter (Q2) net income was $23.5-million (three cents per share) and EBITDA (earnings before interest, taxes, depreciation and amortization) was $59-million on net revenues of $134-million. All financial figures are in U.S. dollars. 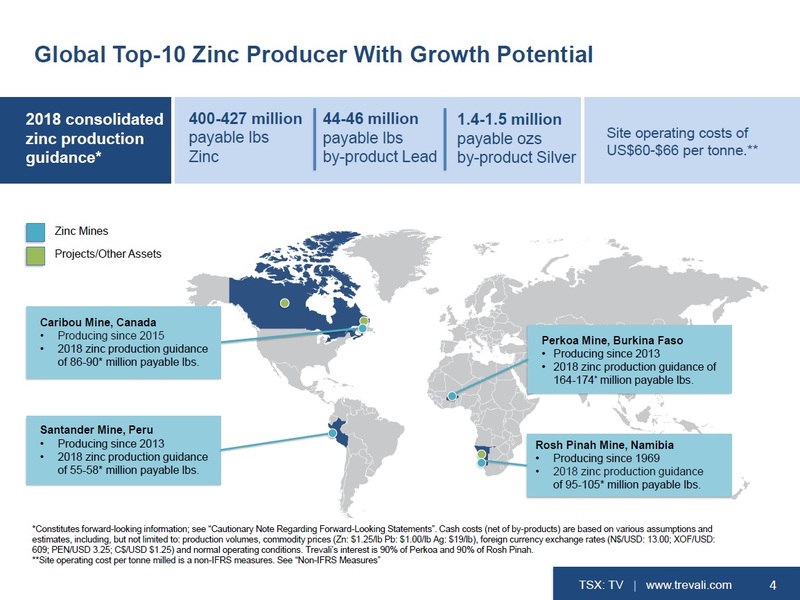 On July 18, 2018, Trevali Mining Corp. has released preliminary consolidated second quarter 2018 production of 103.9 million payable pounds of zinc, 10.5 million payable pounds of lead and 337,801 payable ounces of silver. Normal concentrate shipping schedules realized at all operations.